Happy FriYay, friends! We’re gearing up for our annual Christmas cookie and craft beer exchange this weekend. I have a couple batches of cookies to bake and a house to clean, but then the party can start! We’re looking forward to spending a fun night with friends before family rolls into town for the holidays next week. 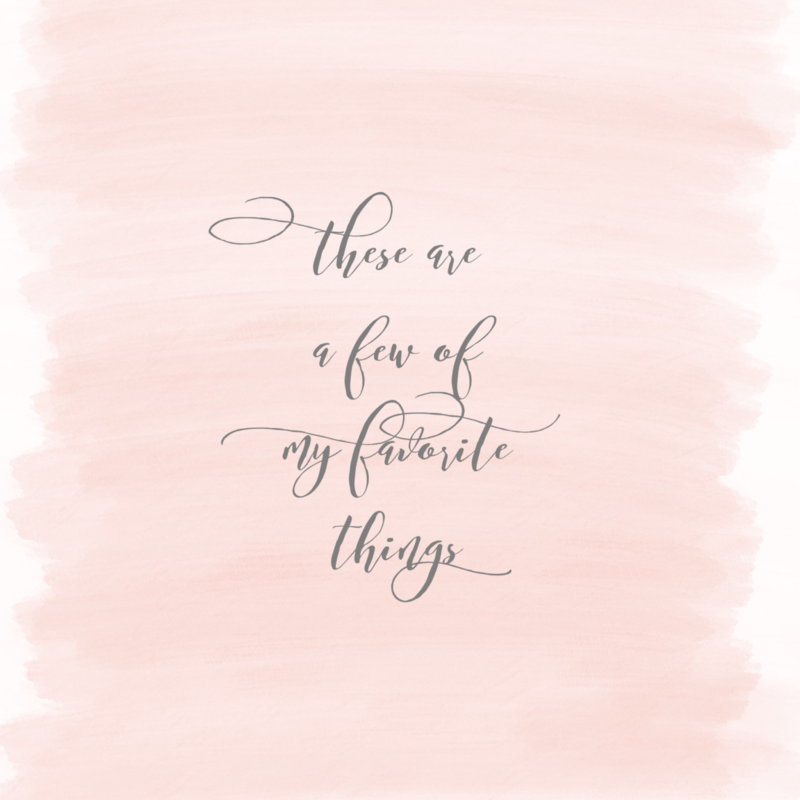 Here’s a roundup of some of my favorite things from the week. I’d love to hear what you’re loving lately — chime in by leaving a comment! 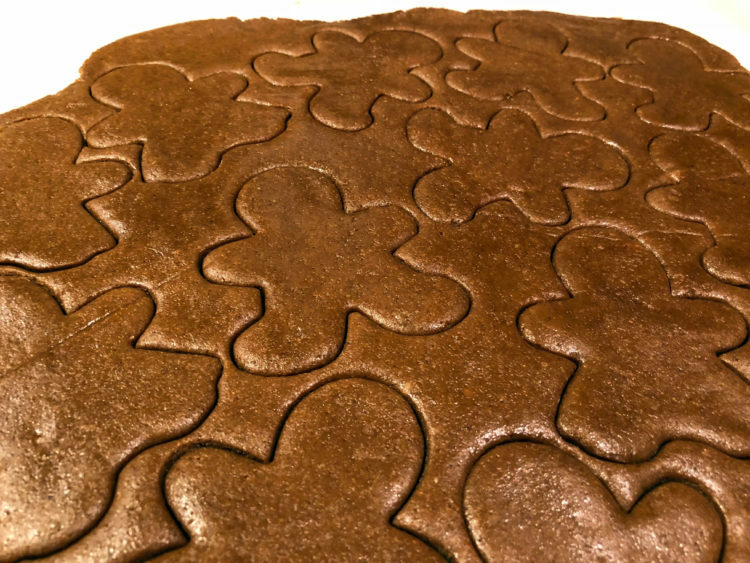 I haven’t made gingerbread in years, despite it being one of our favorite Christmas cookies. I decided to whip a batch up this week and tried out a healthier version from A Couple Cooks. Guys, these cookies are insanely good! The gingerbread is soft, with the perfect amount of zip from the ginger. This is my new go-to recipe. Oddball Fermentables opened in Bloomington last year, and we finally got around to checking it out. They make mead and cysers, which are a cross between cider and mead. 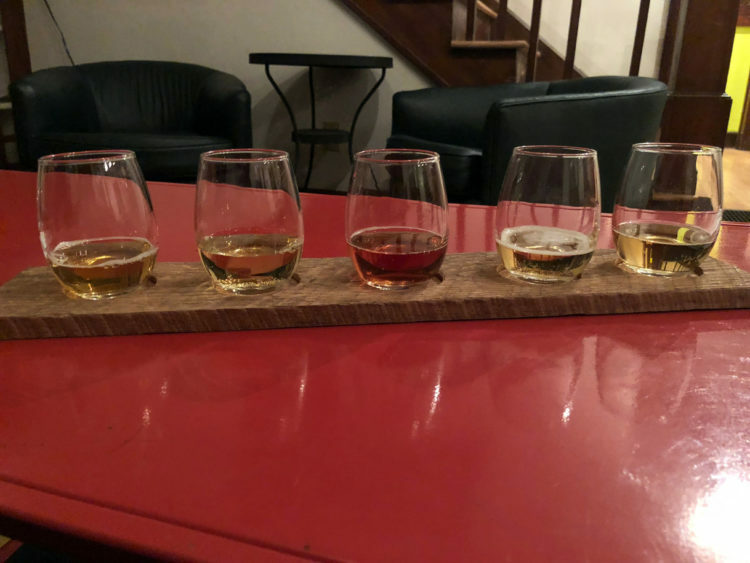 I got a flight and liked everything I tried, but I especially loved the HopBerry Blue. It’s a blueberry cyser with Centennial hops, which gives it a delicious bitterness at the end. What I liked most about Oddball is the atmosphere. They’re located in a beautiful old house on Walnut, and, in addition to tables and a bar, there’s a couch and several comfy chairs surrounding their fireplace. It makes you feel like you’re hanging out a friend’s house instead of at a bar. 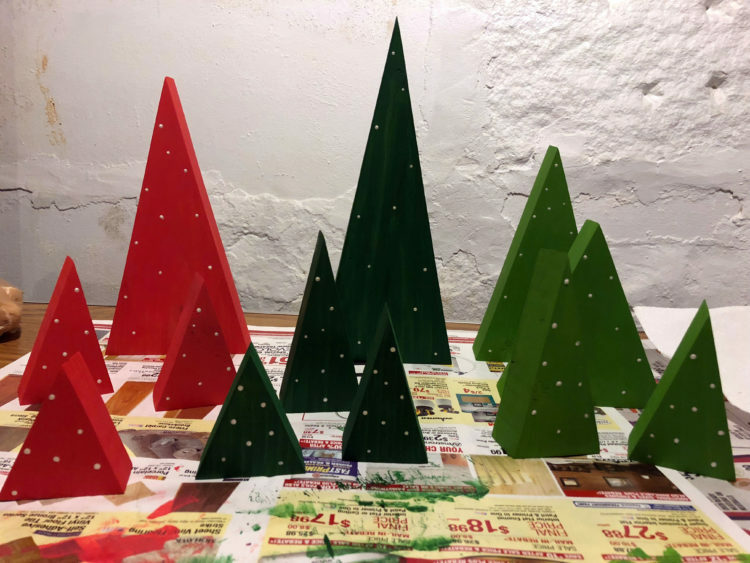 I decided to get a bit crafty this holiday season and make these wooden Christmas trees to add to our usual decor. Our friend Mark helped us cut the wood, James sanded down the edges, and I did the painting! They were so easy to make, and I’m pretty happy with how they turned out. I also forgot how much fun painting can be! I also made this wood bead garland, but it was definitely more labor intensive. My garland also ended up being only about 2 feet long by the time I got done, so I’m not sure it was worth the effort. But, our house is certainly decked out for the holidays this year. I joined Orange Theory when it opened in Bloomington in October, and I’ve been loving the intense group workouts. If you’ve never done an OTF workout before, here’s how it works: You wear a heart rate monitor as you make your way through a series of treadmill, rowing and weight circuits. While it’s a group workout environment, everyone goes at their own pace. 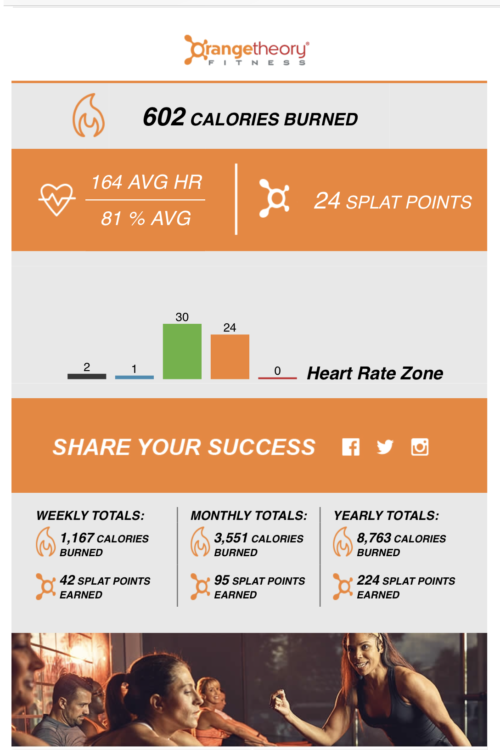 You earn splat points for every minute you spend in what’s called the orange zone, which is 84 to 91 percent of your maximum heart rate. I’ve always loved high-intensity workouts, and that’s exactly what you get with OTF. I rarely get bored, and I always leave feeling stronger. I had to save the best for last this week. My best friend Katie is getting married in October, and this week she sent out packages asking girls to be in the wedding party. 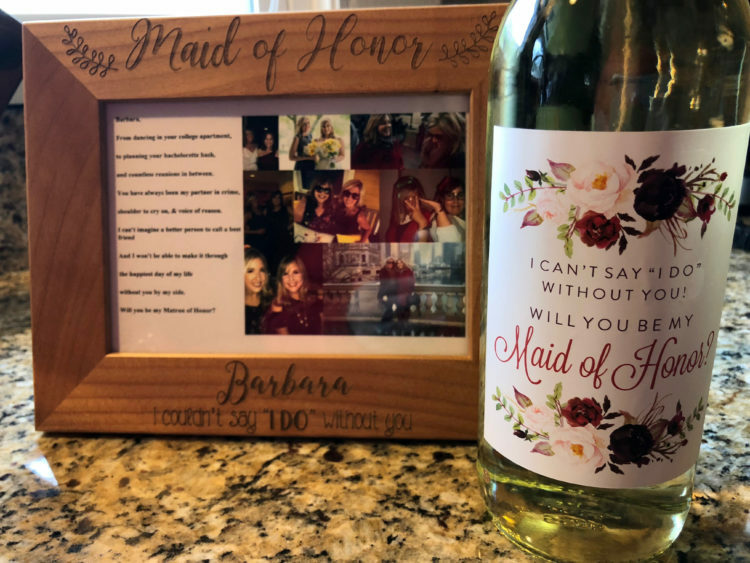 The wine and picture frame she included are so cute! I can’t wait to share MOH duties with our other best friend, Emily. We all live in different parts of the country, so it’s exciting to have fun wedding-related activities like a bachelorette party to reunite us. Let the planning begin!